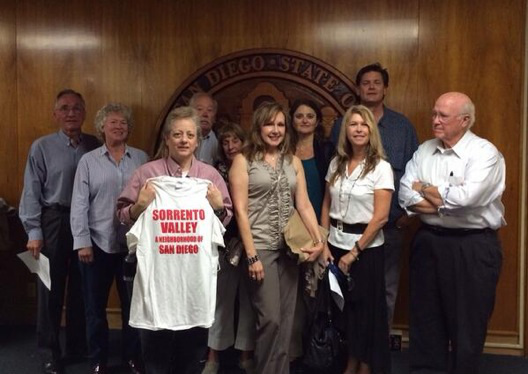 About a dozen members and directors of the Sorrento Valley Town Council stood before the City Council on May 19 requesting the City's help in getting our neighborhood signs installed. Three SVTC Directors and one member each spoke to the Council about the importance of nurturing and promoting the identity of our neighborhood. Our District Representative Lorie Zapf was not in attendance, "due to a family emergency," according to Council President Todd Gloria. Most of the speakers mentioned Lorie Zapf's omission of Sorrento Valley on her website map as well as her refusal to install our neighborhood signs. Director Wayne Cox spoke of how it would be in the "best interests of the city economically to recognize our neighborhood's identity, which is world-known for all things high tech." Long-time resident and SVTC Treasurer Lil Nover explained that our neighborhood council was formed in order to represent and give a voice to over 5,000 residents, businesses, and landowners in the neighborhood. Ms. Nover pointed out that thousands of businesses and landowners identify with Sorrento Valley, "so much so that hundreds of businesses and/or business parks include Sorrento in their business name." Sorrento Valley native Craig Jackson pointed out that residents who have lived in the neighborhood for almost 20 years have always considered this area Sorrento Valley, corroborated by all of the major authoritative websites, such as Google Maps, Yahoo! and the entire real estate industry. SVTC Secretary/Editor Susan Carolin stated that "being treated as if our neighborhood actually does not exist is insulting, disrespectful, disheartening and could be financially damaging to the thousands of residents and hundreds of businesses who call the neighborhood of Sorrento Valley their home and/or place of business." Because this was not on the Council's agenda, no discussion between the SVTC and the Council was permitted after our presentation. Todd Gloria did thank the group for their work towards their community, and suggested we continue our efforts through the Mayor's office and the planning groups.